The order in which candidates will appear on the April ballot has been announced and the state’s randomized process provided only two incumbents with the benefit of being the first names listed. Of the seven offices that will be determined in the April 10 election—which includes the mayor’s seat, four city council positions and one seat each for the Long Beach Unified School District Board (LBUSD) and the Long Beach Community College District Board (LBCCD) of Trustees—only Seventh District Councilman Roberto Uranga and Area 1 LBCCD Trustee Jeff Kellogg will be listed first. There have been multiple studies that have suggested that ballot placement can influence votes, with the candidate listed first typically receiving a bump of a few percentage points. Some studies have suggested that in a field containing multiple candidates the difference between being listed first and being listed last could mean as much as 10 percentage points. National Public Radio revisited the issue in 2016 prior to the presidential election that November, and several educational institutions, including the University of Vermont, Stanford University and Northwestern University, have published articles on the psychology of ballot order. 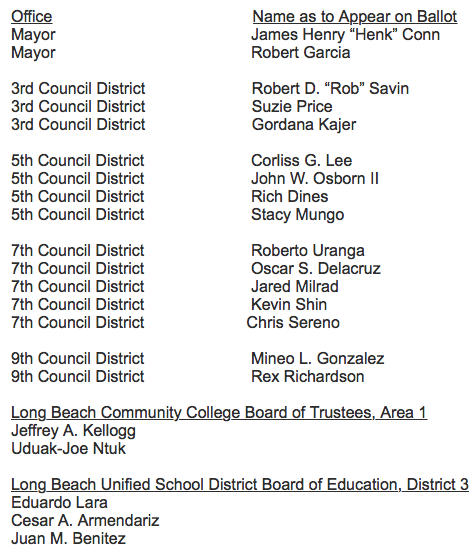 The order of candidates as they will appear on the April 10 ballot as announced by the Long Beach City Clerk’s office. The order was determined through a randomized alphabet drawing on January 18 by Secretary of State Alex Padilla. It tied letters to positions numbered 1-26 and drew numbers to determine which candidate would be listed first. In this instance, James “Henk” Conn is up against Mayor Robert Garcia. The letter “C” was tied to the number 15 and the letter “G” was number 18. Conn will be listed first on the ballot. Four office races were cancelled and incumbent candidates were appointed during a city council meeting Tuesday night because the four incumbents lacked an opponent. Those seats included the first council district and the city wide positions of auditor, city prosecutor and city attorney.